Ceiling Fan Parts - capacitors for ceiling fans. We carry all the different ceiling fan capacitors. We have the 2 wire, 3 wire, 4 wire, 5 wire and 6 wire. 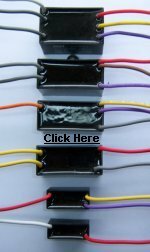 Please call us with the wire colors and the ratings written on the capacitor. If you are not sure that the capacitor is bad, send it to us for free testing.